Seventh Son is a 2014 American epic fantasy film directed by Sergei Bodrov and starring Ben Barnes, Jeff Bridges, Alicia Vikander, and Julianne Moore. It features music composed by Marco Beltrami, who replaced A. R. Rahman and Tuomas Kantelinen. It is based on the novel The Spook's Apprentice (titled The Last Apprentice: Revenge of the Witch in the US) by Joseph Delaney. The story centers on Thomas Ward, a seventh son of a seventh son, and his adventures as the apprentice of the Spook. After having its release date shifted numerous times, the film was released in France on December 17, 2014 and in Canada and the United States on February 6, 2015. The malevolent witch Mother Malkin is imprisoned in a chamber by Master Gregory, the last of a knightly order known as the Spooks who have long defended humanity against supernatural threats. After many years have passed, the beginning of a centennial event known as the Blood Moon increases Malkin's power, allowing her to morph into the form of a dragon and break free from her confinement. Gregory's apprentice Billy Bradley finds the Spook at a tavern, telling him the bells have rung for his help. After dealing with an armed man when he initially refuses to leave, Gregory answers the call and follows Billy to a small girl that appears to be possessed. Gregory realizes that she is possessed by Malkin, and exorcises the witch from the girl. Malkin attempts to control Billy with her magic, but he resists. The two attempt to subdue and burn Malkin, but she escapes while killing Billy in the process. 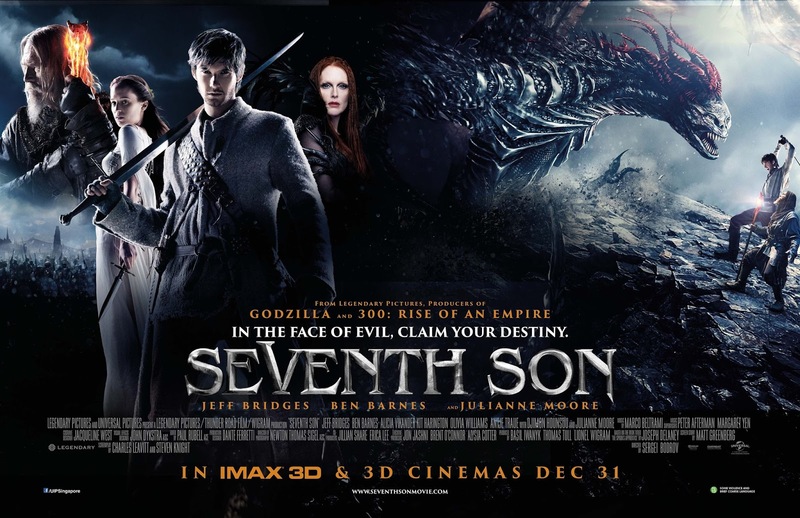 Tom Ward, the seventh son of a seventh son, has recurring visions of Gregory and an unknown girl, and realizes that he's going to leave home soon. When Gregory arrives, he offers Tom's parents a great deal of money if they allow him to take Tom as his new apprentice. Before he leaves, Tom's mother gives him her necklace, which holds a strange stone. In a town along the way, Tom sees a girl with pointed shoes about to be burned by a mob as a witch. Recognizing her as the girl from his visions, he reveals that he is Master Gregory's apprentice and insists that he be the one to decide if she is a witch and to deal with her if she is. After getting her away from the mob, he releases her. The girl, named Alice, tells him more about what happened to Gregory's previous apprentices, and encourages him not to tell his master about her. Malkin returns to her stronghold, restoring it to its former condition. She meets with Bony Lizzie, her sister and Alice's mother, who has been disfigured by her last encounter with Gregory. Malkin heals her disfigured face, and the two begin gathering their allies and servants to conquer the world of humans. When Alice arrives shortly after, Malkin notes her human father and wonders about her loyalty. Alice becomes increasingly wary and distrustful of Malkin after she executes one of the assassins that the warlock Radu offers to her. On the road, Tom meets Gregory's assistant Tusk, and goes through rushed training to learn how to fight witches before the Blood Moon is full and Malkin becomes too powerful to stop. Tom meets Alice a second time, who has been sent by the other witches to spy on Gregory. At a city along the way to Malkin's stronghold, Gregory and Tom subdue one of Malkin's followers: a werebear warlock named Urag. Gregory instructs Tom to burn Urag, but the apprentice refuses with the Spook reprimanding him while burning the warlock himself. Gregory leaves on tense terms, while Tom remains behind. He and Alice briefly consider leaving on their own and getting away from the battle between Gregory and Malkin, but Tom has a vision of Malkin killing Gregory and unleashing destruction upon the world. He finds Gregory at a grave site, where the two reconcile and Gregory reveals more of his past with Malkin. On their continuing journeys, the two encounter an enormous creature in the woods. It pursues them over a cliff and into the river, and Tom narrowly manages to kill the creature and survive being swept down a waterfall. He is then confronted by Bony Lizzie, who attempts to cut out his heart, but he overcomes her using the stone in his mother's necklace. Lizzie claims it belongs to Malkin and flees in her beast form. Gregory later reveals that the stone increases the power of witches and belonged to Malkin's clan. From this, he deduces that Tom's mother was a witch. Lizzie reports to Malkin about the stone. They instruct Alice to use Tom's feelings for her against him and steal the stone, promising to leave Tom alive if she does. Malkin and her minions then proceed to attack the city to avenge Urag. Mam reveals her presence when she kills one of Malkin's allies after sending her husband and her daughter to safety. Mam is confronted by Malkin and is killed by the witch as she mocks her for giving away the stone that would have saved her life. Alice finds Tom one more time and pleads with him to leave with her, taking the stone without him noticing. Gregory attempts to kill Alice, calling her a spy, but Tom stops him and lets her go, insisting that she isn't the enemy. More of Malkin's minions, led by Radu, come and attack Tom and Gregory. Although they fight back, the minions capture Gregory and knock Tom off a cliff, leaving him for dead. Tom then has a vision of his mother, who tells him not to mourn for her and that he must stop Malkin from using the stone. The witches gather as Malkin attempts to seduce Gregory into joining forces with her and the clan with her magic. Alice is horrified to hear that Tom was left for dead. Remorseful of her actions, she grabs the stone from Malkin and runs away with it, breaking Malkin's hold on Gregory. Radu briefly turns into a dragon before Gregory convinces the warlock to fight him man to man, while Bony Lizzie is forced to turn on Malkin to protect her daughter as Alice drops the stone. Tom arrives looking for the stone and confronts Alice. After she reveals her reasons for stealing it, she fights against Malkin's minions and kills several, but is overcome by an Indian warlock called the King of Swords. Eventually Tom finds the stone and kills the King of Swords and another of Malkin's servants while Gregory kills Radu with one of his blades. Malkin defeats and kills Bony Lizzie in front of Alice, but is mortally wounded in turn. Gregory confronts Malkin in her room as she appears close to death. He conceals a knife, but Malkin grabs him with her claws. Tom arrives and throws a blade at Malkin, freeing Gregory, and finishes her off by burning her body. Afterwards, Gregory acknowledges Tom's training as complete and gives him the brand that signifies his status as his replacement. He believes he is set to depart with Gregory, but Gregory tells him he is ready to stay with Tusk and defend the town as the new Spook. Tom and Tusk board the carriage and ride off together to the sound of the bells, ringing for their services.